to form the supporting framework of some organs, such as the walls of airways (nose, trachea, larynx and bronchi), where it prevents airway collapse. to form the template for the growth and development of long bones, and most of the rest of the fetal skeleton (gradually replaced by bone). In children, the cartilaginous plates at the ends of long bones can be seen on X-rays. These templates disappear when adults reach their full height. Cartilage is a strong, flexible and semi-rigid supporting tissue. It can withstand compression forces, and yet it can bend. It is made up of cells called chondroblasts and chondrocytes, (chondro - cartilage) and extracellular matrix, made up about 10% aggrecan, 75% water, and a mix of collagen fibres and other constituents. There are three types of cartilage, which differ mostly in the type of fibres they contain. Hyaline: Most common - has a glassy appearance (hyalos - is greek for glass). Fibrocartilage: tendon insertions and invertebral discs: reinforced with parallel bundles of collagen fibres. Elastic cartilage: external ear and epiglottis: flexible and resilient - has elastic fibres as well as collagen fibres. Click here to find out more about these three types. This diagram shows the structure of an aggregate of Aggrecan (another name for the aggregating GAG chondroitin sulphate). Aggrecan is only found in cartilage. The aggregates contain up to 100 molecules of chondroitin sulphate (shown in purple) are bound to one molecule of hyaluronic acid (shown in red). The extracellular matrix soaks up water, like a sponge, (osmotic effect) due to the properties of the GAG: aggrecan, producing the high water content (75%). The collagen fibres form a network which has a very high tensile strength, and which entraps the aggrecan molecules. When you stand up or walk, the weight of your body is supported by the cartilagenous ends of the long bones. In this state your weight compresses the cartilage, literally squeezing the water out, until the force produced by the osmotic swelling is equal to the compressive force generated by your weight. In growing cartilage, the chondrocytes can divide, and the daughter cells remain close together in groups, forming a 'nest' of 2-4 cells. The matrix enclosed compartments that they sit in are called lacunae. (lacunae = little lakes/small pits). The active chondrocytes are large secretory cells with basophilic cytoplasm because they have lots of rough endoplasmic reticulum. 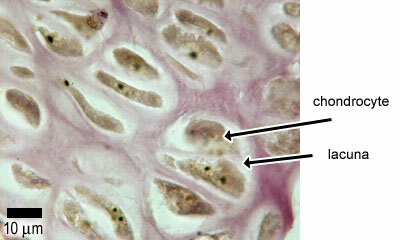 Older chondrocytes contain fat droplets. The surface of most cartilage is covered by a layer of dense irregular connective tissue called the perichondrium (peri = around). The outer layer of the perichondrium contains collagen producing fibroblasts, and the inner layer contains chondroblasts. Unlike other connective tissues cartilage is avascular (like epithelia). Cartilage is nourished by long range diffusion from nearby capillaries in the perichondrium. Therefore, cartilage can never become very thick, as diffusion would not be sufficient to supply the cartilage with nutrients and oxygen. (This is in contrast to bone, because bone has a very good blood supply). Cartilage can grow in two ways: Interstitial growth - chondrocytes grow and divide and lay down more matrix inside the existing cartilage. This mainly happens during childhood and adolescence. Appositional growth - new surface layers of matrix are added to the pre-existing matrix by new chondroblasts from the perichondrium.